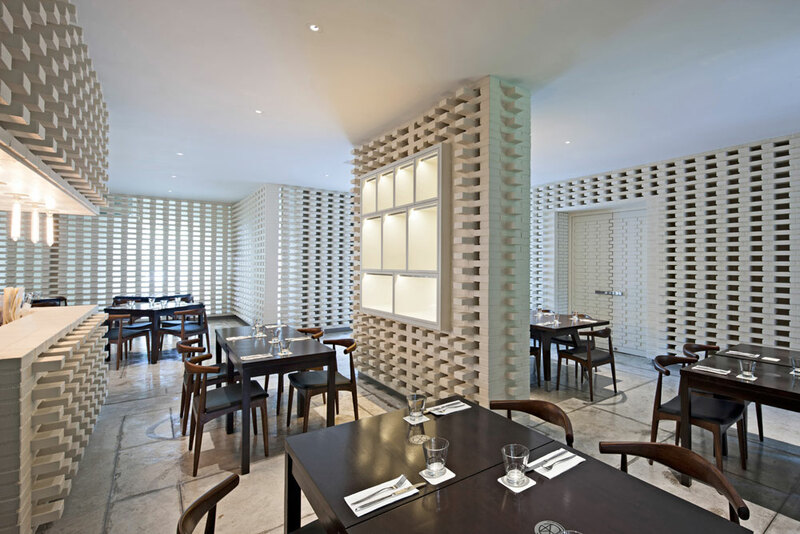 A simple but dramatic interior wrapper of bone white-painted brick surrounds the vertical surfaces of the main dining room of Commune. Located in the Tanglin area of Singapore, in the historic Phoenix Park compound (once a British military outpost), the design purposefully interferes with and obscures views to the exterior landscape. This is a means of blocking unsightly views while allowing breeze and light into the interior. The continuous perforated screen composed of standard solid bricks alternates about each coursing, rotated perpendicular to the row below and above. The simple, repeatable element is consistent except for one parameter being changed: the perpendicular brick pattern subtly undulates in plan, moving in and out to accommodate existing columns, openings, and air conditioning components. The effect is a subtle gradation, producing a dynamic experience of movement similar to that found in the paintings and sculptures of artists exploring optical effects. Works by Bridget Riley, Julio Le Parc, and Victor Vasarely are examples. The resulting optical effect recalls the ventilation screens of mid-century tropical ventilation architecture. At night the optical obfuscation is inverted, and the restaurant takes on the appearance of a glowing lantern, emitting light to the exterior. 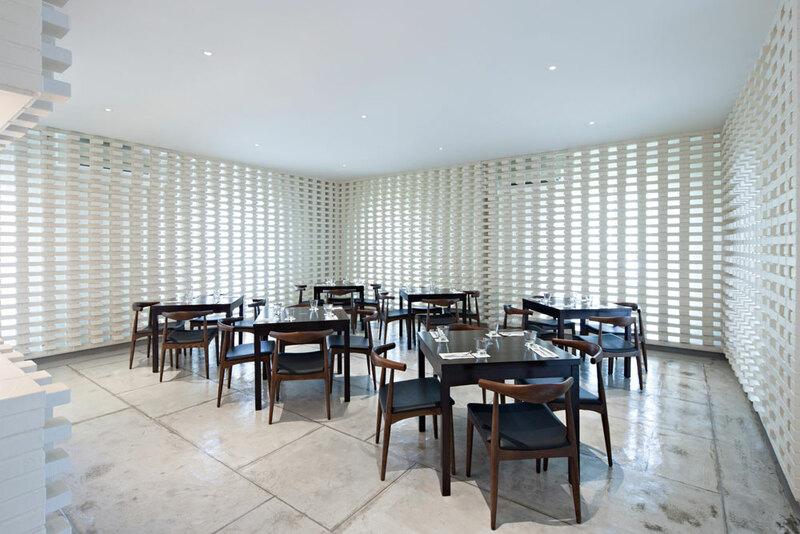 The graphic identity of the restaurant is inlaid on the concrete floor as well as tabletops—small details that produce a cohesive design experience. 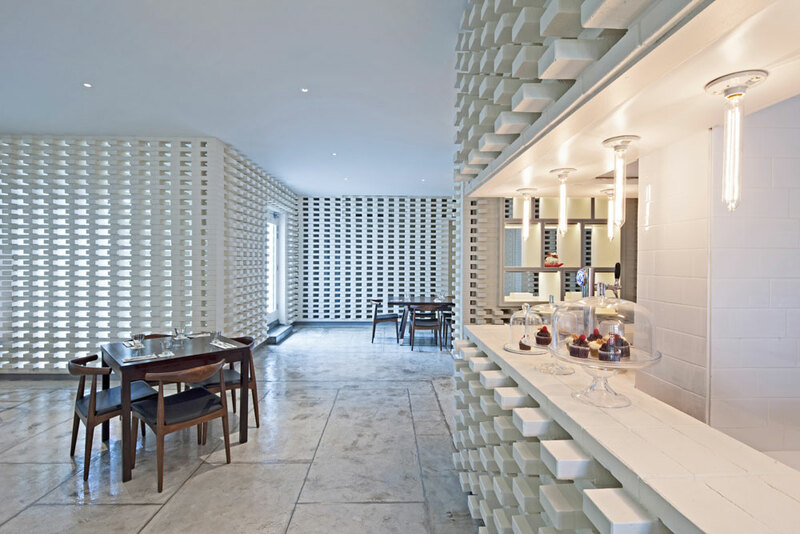 The other surfaces (floor, ceiling, kitchen walls) are purposefully minimized in terms of visual impact. 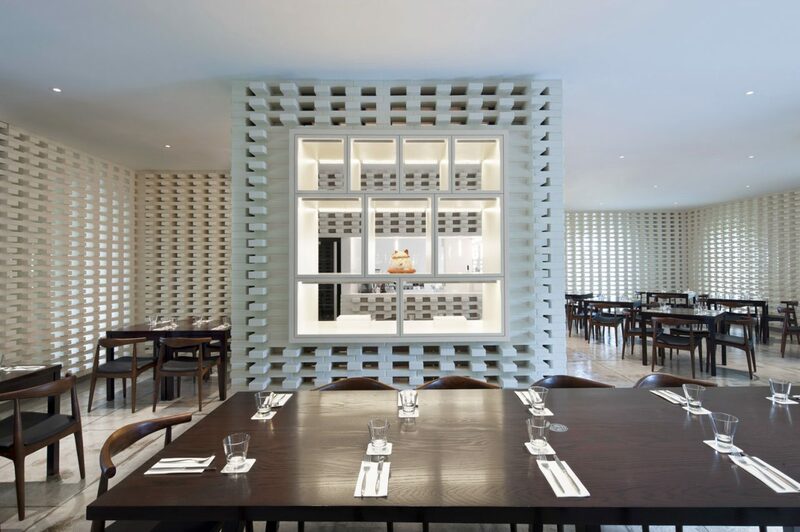 This is a reductive design strategy to focus and maximize the impact of the perforated brick screen. 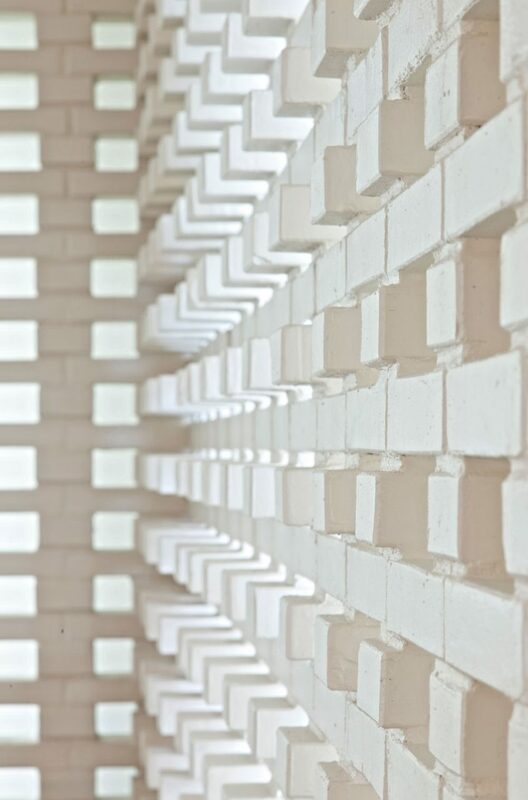 A Simple Brick Interior illustrates how the most straightforward of materials—bricks—when carefully and thoughtfully deployed, can produce comfort and excitement, screen and effect, wall and veil in a design of simple yet powerful elegance.